Meet FRANCESCA. 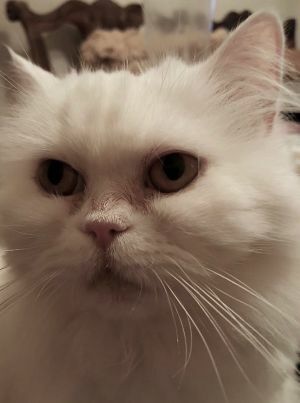 She is a 10 year old BEAUTIFUL all white PERSIAN that we took into our rescue after her owner passed away and left Francesca homeless for the first time in her life. We shaved Francesca’s coat when we saw that her fur seemed a bit matted, but it will grow back THICK and LUSH in no time. Francesca is VERY SWEET and quite ADORABLE, just look at that face! She gets along fine with other cats too. Losing one’s owner has been upsetting for Francesca, so it is understandable that she appears a bit shy and nervous upon first meetings. But we are confident that in no time, Francesca will regain her confidence with a patient adopter who will give her time to adjust to new surroundings. If you would like to meet Francesca, she is available for “Meet and Greets” in Westchester, NY. (Only applicants from the NY tri-state area will be considered.) She is spayed, UTD on shots, and FIV/FeLV negative.